A common image of President Barack Obama in Netflix's "Barry" is that of a quiet young man, cigarette often in hand, looking towards something or reading. He’s always thinking. But as much as director Vikram Gandhi's film is motivated by presenting a young Barack Obama as a vessel for different conversations of identity, race and what defines an American, its scant narrative eloquence limits those ideas to mere food for thought. Devon Terrell's performance as Barry is warm, always leading with empathy and a genuine smile. But there’s an air of perfection that constantly threatens to dehumanize Barry; the biggest flaw he has in the film, I’m pretty certain, is that he carries an open beer around campus. 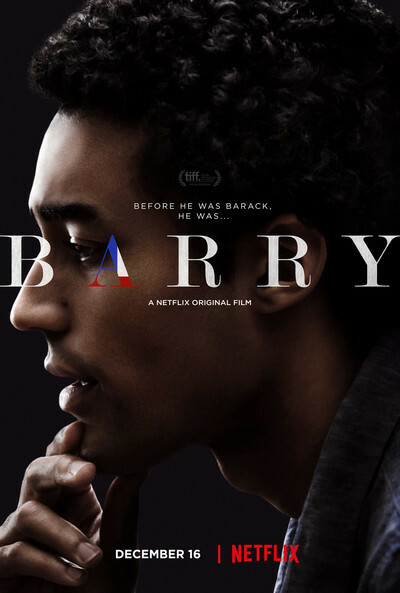 “Barry” devolves into a protective tale of a genius, the story of how a person become a genius of the people. And yet we don’t need a perfect depiction or vision of genius for President Obama. As Ta-Nehisi Coates pointed out recently on “The Daily Show” regarding what Obama had to do to become president, he had to be “scholarly, intelligent, president of Harvard Law Review ... the product of some of our greatest educational institutions.” For a human being who had to achieve so much through tried-and-true intellect, making him into a symbol doesn’t best serve his origin story. Not a lot happens in this non-biopic of President Obama, and that’s fine. Adam Mansbach’s script resists putting Barry on a narrative quest other than self-discovery, which concerns him finding his place, as a young black man, in the world. He interacts with different people, who provide perspective outside of the voice in his head. He has a girlfriend, Charlotte (Anya Taylor-Joy of “The Witch”), who tries to understand him personally, even connecting with him by saying that she spent five days in Kenya once. Later, while playing basketball, he meets PJ (Jason Mitchell of “Straight Outta Compton”), who provides Barry with a look at the projects while sharing his own hustle, which will lead towards a lucrative, corporate job. Barry's friends Saleem (Avi Nash) and Will (Ellar Coltrane) provide different ideas of how young, idealistic people try to connect with others. None of these supporting characters are particularly well-defined, despite the clear heart in each performance. Gandhi’s filmmaking, his first time for a feature after examining fake icons with the gripping doc “Kumaré,” starts off with promise. I loved a righteously angry edit to the next scene after a white student asks Barry during a class debate, “Why is it always about slavery?,” not dignifying that with a response. But the script constantly undermines its potential, like a big scene at the end where Barry is shown at a very white wedding talking to two guests who are older, established and brilliant people of color. Their advice for him is hammy, however important, and the two are treated with an uncomfortable sense of being capital-S Special. Not because they are the only minorities invited to the wedding, but what they represent for the script. There are moments in which “Barry” gets across what it wants to elucidate, and one involves Barry getting a mini tour from PJ in the projects before a party (PJ calls it “Projects Safari”). You can tell that Gandhi really cares about this scene as he shoots it with an extended Steadicam shot, but that isn’t what makes it memorable. Taken up the grimy stairs and down the ghostly hall of the apartment building, Barry is presented ideas of class and race he doesn’t see in his university bubble, with PJ ending the tour with the poignant statement of “This is what the government did to us.” The scene concludes later, with Barry leaving the party, saying “This ain’t my scene.” That line means much more than just his take on party culture, and it’s a type of delicacy the script’s dialogue could benefit more from. Overwritten in spite of its many quiet moments, “Barry” is a movie that can make you appreciate tactful cultural references in biopics. Every book title mentioned, or even a viewing of “Black Orpheus” with his mother (Ashley Judd), is delivered with heavy hands. Worst example: Barry is seen reading Invisible Man on the basketball court and earns the nickname “Invisible” from PJ. Later on, a book vendor on the street remarks about the book, “We been waiting on a sequel for a long time.” This is that kind of true story script, where every reference or interaction is overly considered. When watching “Barry,” it’s impossible to not think about this year’s “Southside with You,” which imagined Barack Obama and Michelle Robinson on their first date, in a Richard Linklater-esque walk & talk slice of life. As the dark clouds of an inauguration draw near, the two films now play like eulogies for Obama’s progressive presidency. And though they’re two completely different projects, they share the same motive: to not be Obama biopics but express moments in time of this all-American icon, zeroing in on the values that led to his two-time election and historic time in office. The problem with “Barry” is that it hardly passes the test that “Southside with You” excels at, which is being a prologue that can exist without the context of the epilogue. Watching Gandhi's film, which seeks to ground him as a guy (who never goes by Barack), who likes to dance, smoke, play basketball and might do something important one day, the film’s inability to become a statement of its own constantly has us remembering how it all ends.